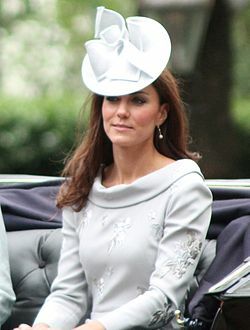 Catherine, Duchess of Cambridge (Catherine Elizabeth "Kate" Middleton born 9 January 1982) is the wife of Prince William , Duke of Cambridge, and a member of the British Royal Family. Royal insiders have called Kate Middleton, with her grace and sporty elegance, "a natural" as Prince William's wife. On April 29, 2011, the couple married in a fairy tale ceremony at London's Westminster Abbey , ennobling the commoner as the Duchess of Cambridge.